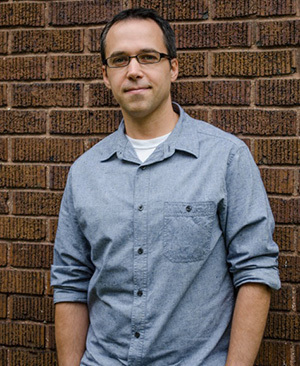 Jeff Spoonhower ’99 has been appointed assistant professor of film and digital media production in Notre Dame’s Department of Film, Television and Theatre (FTT) after two years as a popular visiting faculty member in the department. A 12-year veteran of the video game and animation industries, Spoonhower shares with students the very same production techniques and tools he uses in his award-winning professional work. Spoonhower grew up with art and music, taking studio art and painting classes, and participating in a variety of musical endeavors throughout grade school, junior high, and high school. Spoonhower continued to pursue his storytelling passion as an undergraduate at Notre Dame, where he studied film production. He went on to complete a master’s degree in computer animation at Rochester Institute of Technology, and took his first job at Electronic Arts as a character animator for its NFL Street games in 2002. Since then, Spoonhower’s projects have received numerous industry awards, most notably his work for 2K Games on Evolve, which won top honors at the annual E3 video game convention, including Best of Show, Best Console Game, Best Action Game, and Best Multiplayer Game. Evolve will be released this coming spring. Spoonhower also served as senior video editor and animator on Borderlands 2, which won several Game of the Year awards and sold more than 8 million copies, becoming the best-selling and highest-rated title in 2K’s history. He is currently developing several short film and independent video game ideas that he plans to take into production over the next year. Because Spoonhower will continue to work while teaching at Notre Dame, his film and animation production students will get to learn about the latest best practices that he uses on a daily basis. Spoonhower said he also learns a great deal from his students, whose creativity, hard work, and enthusiasm inspire him to become a more effective teacher. After living on both coasts and points in between while working in the video game industry, Spoonhower said he was happy to be back in South Bend. Returning to the College of Arts and Letters is also meaningful, Spoonhower said, because he can now help students develop the essential skills that allowed him to turn his passion into a career. Originally published by Aaron Smith at al.nd.edu on September 12, 2014.